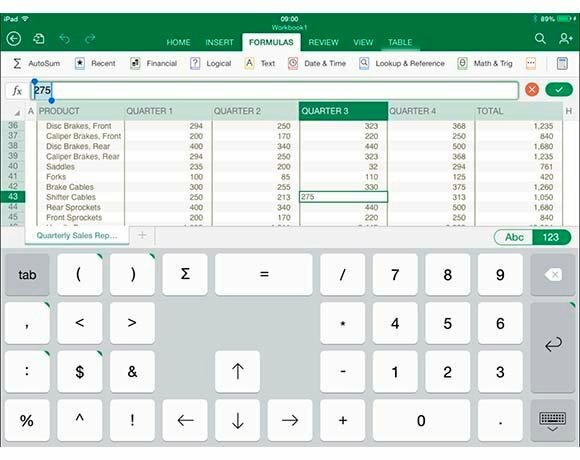 Excel for iPad: Excel’s custom keypad - Test drive: Is Microsoft Office for iPad a strong start for mobile Office? Excel for iPad is also well specified, with support for tabs, a wide range of formulas, tables, charts including the excellent recommended chart feature, which chooses a chart type based on the current selection; images and shapes, sorting and filtering, and more. A custom on-screen keypad offers numbers, brackets, cursor keys and commonly used mathematical operators. While the essentials are in place, Excel for iPad is missing features including split windows (though you can Freeze Panes), editing data validation, adding or editing pivot tables, running macros, and connecting to external data.